When you purchase real property, rely on Fidelity National Title to protect your interests with proper escrow funds disbursements and successful and timely closings. You’ll be served by the leading title company in the U.S., backed by more than 160 years of successful title operations. 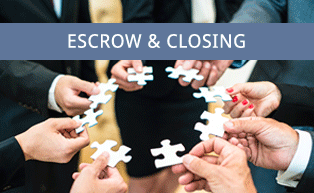 An escrow is an arrangement in which a disinterested third party, called an escrow holder or settlement agent, holds legal documents and funds on behalf of a buyer and seller, and distributes them according to the buyer’s and seller’s instructions. People buying and selling real estate often open a sale transaction with the settlement agent for their protection and convenience. The buyer can instruct the settlement agent to disburse the purchase price only upon the satisfaction of certain prerequisites and conditions. The seller can instruct the settlement agent to retain possession of the deed to the buyer until the seller’s requirements, including receipt of the purchase price, are met. Both rely on the settlement agent to carry out faithfully their mutually consistent instructions relating to the transaction and to advise them if any of their instructions are not mutually consistent or cannot be carried out. Fidelity National Title provides professional escrow settlement services that are a convenience for the buyer and seller because both can move forward separately but simultaneously in providing inspections, reports, loan commitments and funds, deeds and many other items, using settlement as the central depositing point. If the instructions from all parties to the transaction are clearly drafted, fully detailed and mutually consistent, the settlement agent can take many actions on their behalf without further consultation, saving time and facilitating the successful closing of the transaction. Example: Semi-annual Property Taxes in the amount of $665.05 are prepaid by the Seller to July 1st. Date of closing is June 15. There are 15 days’ worth of taxes due to be reimbursed to the seller at $3.69 per day for a total credit to the seller and charge to the buyer of $55.35. Whether this is your first home or fiftieth real estate investment, ask your REALTOR® or broker to protect you and your property with Fidelity National Title.